If you would like to start taming your child's hair into twists, it helps if your child has thick hair. 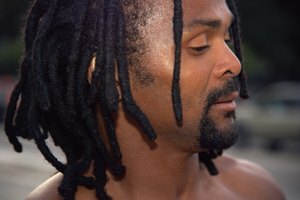 This hairstyle is common on children and older boys of African-American descent. 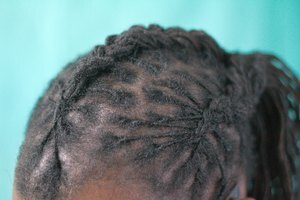 Although the twists are not to be confused with dreadlocks, twisting the hair can be the first step to creating dreadlocks, if you allow the hair to grow and mat together. The twist hairstyle will keep thick, unruly hair manageable and is easier and less expensive to maintain than braids or cornrows. Wash and condition the hair thoroughly, then dry with a towel. Comb the hair thoroughly with a wide-toothed comb and add a quarter-sized amount of hair wax or hair moisturizer. Split an inch-wide section of hair into two sections. Twist the sections together around one another, working clockwise. Use small amounts of hair gel as you are working to keep the hair in position. Wind the end of the hair around your fingertip tightly to keep the twist intact. Continue making sections and twisting them until the entire head is covered. If you feel the hair starting to get dry, continue to add hair moisturizer and gel as you work. Continue twisting each section at the roots every week to maintain the twist hairstyle. Add gel and hair moisturizer as needed to keep the twists smooth. The twist hairstyle works best on shorter hair, but can be maintained as the short hair grows out.